Shirley McElhaney shared a link from Swan’s Candles on facebook this morning that sent me into a whole reverie about encaustic painting. I try not to look at or think of encaustic anything. Especially beautiful encaustic works by other artists. And the wonderful-smelling beeswax. 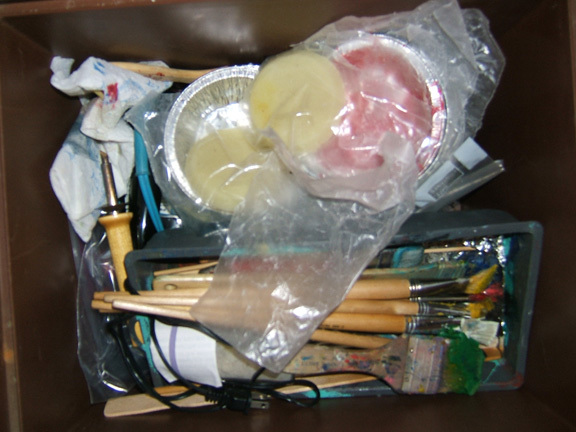 And the delight with just warming up the colored wax and gliding it onto a surface, then when done, just letting it cool down with the brushes still in the individual containers of colored wax, never having a need to clean them. I also love the smell of the melting resin with the wax and making a block of painting medium. So I try not to think about that too. The reason I try not to think about encaustic is that I am resisting (did you like the pun?) any temptation to pick up another medium. But my memories of working with encaustic have been ones of pure pleasure. Sometimes, on days like today, I let my guard down and catch myself thinking about them again. They’re still in their plastic tub from my move six years ago. I am not thinking about them either but for a different reason. A few years ago I bought all the supplies. I spent hundreds of dollars on them. Only to find out I was highly allergic to them. I had good ventilation but it didn’t matter. Something in the formula made me get headaches and have trouble breathing. I sold everything and have never looked back. There are plenty of other mediums out there for me to work in that are not toxic. I guess that eliminates the temptation, Roberta! And you’re right — so many mediums, so little time! I’ll try to help, Martha! It’s too hot to think about encaustics today – I am sure that you will need to wait until at least the end of September. See how easy that was – hope it helped! PS – thank you for sharing such a beautiful painting! Definitely too hot, Deirdre! Thanks for the reminder. Of course, I can always “not” think about it for a little while longer until the weather cools down. Glad you liked the little painting, which has vanished from the face of the earth. Lost in the move! Thank you soooo much, Angela! Glad you enjoyed the posting this morning; and, that it brought nice memories for you. I did not realize you had worked with encaustics. 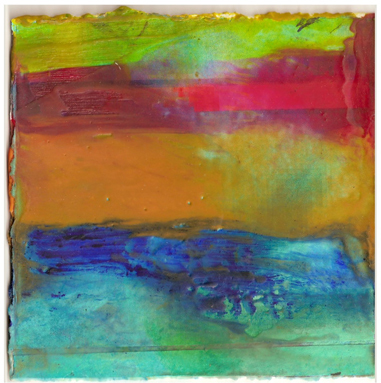 As you know, I have fallen in love with encaustics – I have a true passion for them. Shirley, I was sitting there going through all those thoughts and memories, and it became a blog post today. So thank you for the inspiration! Go back to it for a bit. Then if you choose to, go for it again. That is awesome, Pat! I think I will eventually. Beeswax itself is a good pairing with collage, so I may go that route at least.